Learn English vocabulary and spelling online with award-winning educational technology. Just pick a grade level. 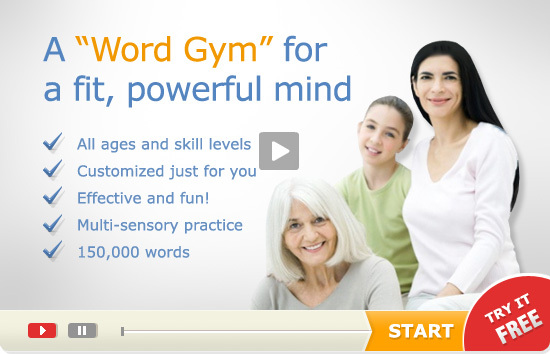 WordGenie™ has sorted words by grade level, frequency, and difficulty, and advances you by logical steps. It’s best to start 2-3 grades lower than your actual grade. The right grade is where you get around 80% of words right. Adjust your grade at any time! Building a good foundation does pay off! You’ll advance faster and with better results. Create your own word list or choose one from our archive. You can also email words to your account. It’s so easy, you can do it from your phone! If you choose this setting, only words that you added will be reviewed. No additional words are introduced. Hugely popular, spelling bees are getting harder every year. Get ready for your big moment on stage! WordGenie™ amassed over 20,000 typical spelling bee words, including consolidated word list, paideia, and spell it lists. Every year we add new championship words. Focus on learning, while we manage your lists for you! Competing for the Scripps National Spelling Bee? Choose vocabulary quiz with added spelling coaching to prep for the vocabulary test. Good college applications require high SAT or ACT scores. This module teaches over 5,000 words you need to know to get that high score. Best choice for learning English as a foreign language. Don’t just learn the words in isolation: learn how to use them in context. Which grade level should you pick? Aim for an easy one, where you get 80-90% of the words right! You can always adjust up or down. Skip through over 2,000 commonly misspelled words to find those that give you trouble. Learn words for life, quickly! Having an effective vocabulary, and spelling the words correctly, are crucial to your academic and professional success. When you speak and write accurately, people take you, and your message, more seriously. Use this module of over 2,000 words after completing the SAT or TOEFL module. Over 7,000 words to prepare English language learners for TOEFL, IELTS, or PTE, and for success at an English-speaking institution. Sorted by frequency and difficulty. Start a free teacher account and send words to your class, online or via email! Detailed reports make students’ speedy progress visible. Rich classroom features save teachers time and effort. ... no matter where you are on your word journey. Our multimedia resources bring words to life! Progress hassle-free with smart adaptive coaching. It's fun, fast, and free. Start now! Select your goal. Change it any time under "preferences". We only email program news. You can always opt out. Enjoy free tutoring and upgrade to premium anytime. Your user name is case-sensitive. Start at an easy level to build a solid foundation. Did somebody refer you to us?